The Gerber Expert Military Flashlight, model 31-000498, has enough power to provide over 100 lumens of intensity for more than an hour. This may be the brightest light you have ever held for its size. The body is made of aircraft grade aluminum that is capable of keeping the light water proof to 3 meters depth. The tail cap of the light has a large switch, accessible even when wearing gloves, for momentary on signaling. 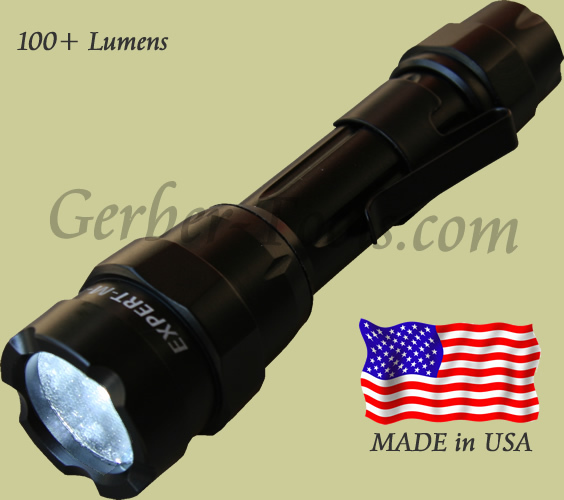 The light is 5.5 inches long, and the clip is suited for attaching to MOLLE webbing. This flashlight uses CR123 batteries which are long lasting, inexpensive, and easily found at pretty much any place that sells batteries. MADE IN THE USA.